Hortus Camdenensis | Prunus laurocerasus L.
Fully-hardy, dense, bushy, evergreen shrub or small tree with glossy, oblong leaves, to 15cm long, and upright racemes of fragrant white flowers, to 8mm across, in spring, followed by cherry-like red fruit, ripening to black. To 8m. [RHSD, Hortus, Hilliers']. The leaves of this plant can be toxic. 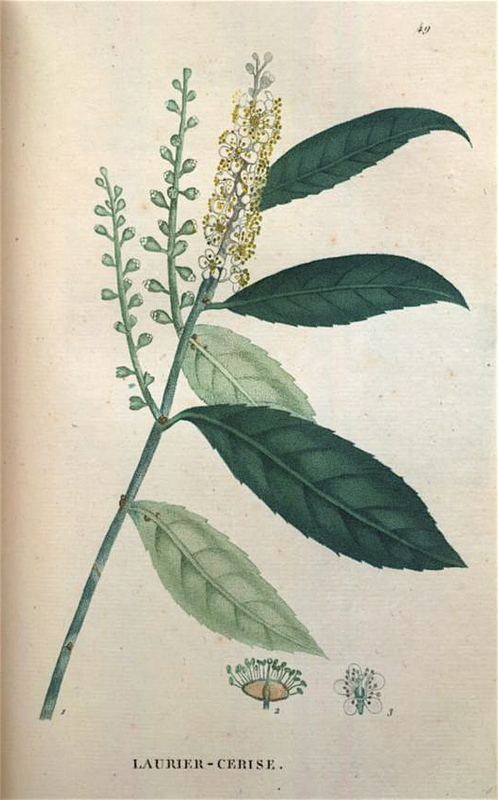 ‘The Cherry Laurel (Prunus laurocerasus L.), so common in shrubberies, has caused numerous accidents both to man and the domestic animals on the Continent, and Gerlach (vide Cornevin) cited a case of the poisoning of twenty-five sheep. The crushed leaves are used by entomologists for killing insects. Its toxicity probably depends to some extent on locality. Henslow remarks that in England it appears to be much less, if at all, harmful, and states that his own cows completely ruined a long laurel hedge, the abnormal food doing no damage either to the cows or to the milk they produced.’ [Long – Common Weeds of the Farm and Garden p.292/1910]. Said to have been introduced to Britain in 1629 [JD] but probably much earlier. Saint-Hilaire Tr. pl.49/1825. Listed in all published catalogues [T.782/1843]. 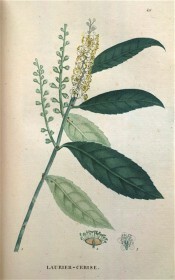 Received per ‘Sovereign’ February 1831 as ‘Common Laurel’. [MP A2948]. More details about Prunus laurocerasus L.
Prunus lusitanica Gueldenst. ex Ledeb.